This mod adds a new weapon to the Open X-Com game: a dart rifle that shoots tranquillizing darts. 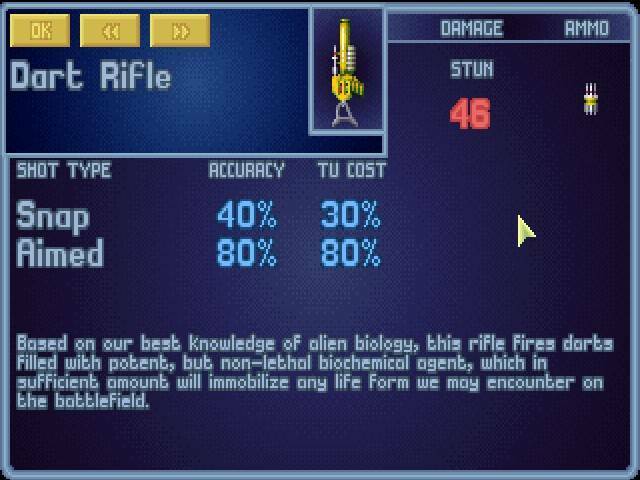 It is an attempt on the X-Com's side to develop a ranged non-lethal weapon before Small Launchers come around. It needs to be researched, but the only prerequisite is finished autopsy of any alien. The dart rifle's combat parameters are unimpressive, but hey, at least you don't have to stick this Stun Rod down that Chryssalid's throat any more! The sprites (Harpoon Gun, naturally) were ripped from TFTD by Dioxine. Not that I couldn't do it myself, mind you. 1.3: now with three different clips! Each consecutive one is harder to research and more potent. 1.4: fixed a research glitch. 1.5: Added more languages, fixed a manufacturing bug. Update here, because the mod site is still down. 1.6: Re-uploaded the mod since the old one was clashing. Updated to the new mod system. Seems to me that by the time I research the stronger tranquilizers, I'm already using small launchers with no problems. If this is happening to others, perhaps you could change the research requirements?